Apparently on a rampage of releasing goodies, Pixar, on top of releasing early Sunnyside Daycare art yesterday, has dropped a fun Easter Egg involving their latest short-form masterpiece that ran in front of Toy Story 3. The short Day and Night stars two characters who are essentially windows into the same world, only one shows that world during the day, the other night. The two meet and constantly try to outdo each other, each showing off activities or events that make one time of day better than the other. 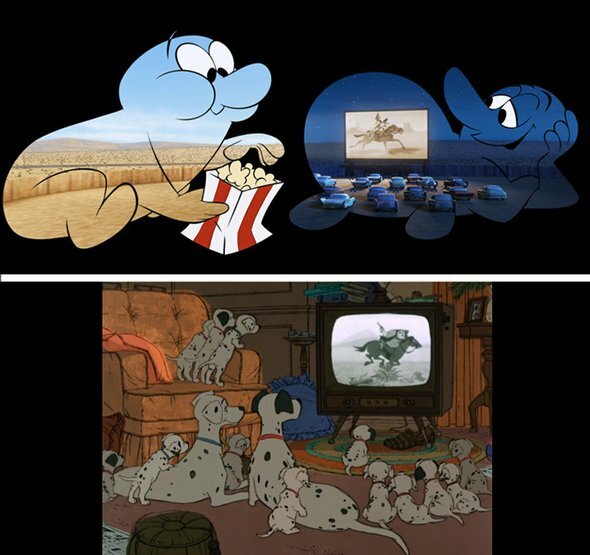 In the image below (found on their Facebook page), Pixar shows off its Disney bona fides by fully referencing the classic 101 Dalmatians for the drive-in scene. Not many beyond the large group of somewhat creepy Disneyphiles would have caught on to something like this, so it’s cool that they let us in on their little secret. You’ll notice that the style of the film playing is different in both scenes, but aside from there possibly being some weird copyright issue they were avoiding, it looks like it was changed just to more properly match the animation style of the piece. It’s still a bandit riding a horse through some deserty terrain, clearly being totally awesome. Hang on tight for some more Pixar goodies since they seem to be on a roll with them. Is Bo Peep The Villain In Toy Story 4?